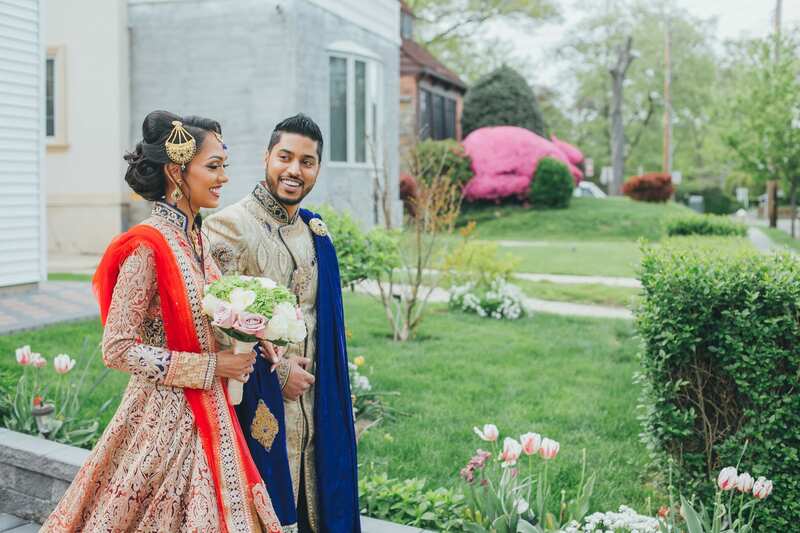 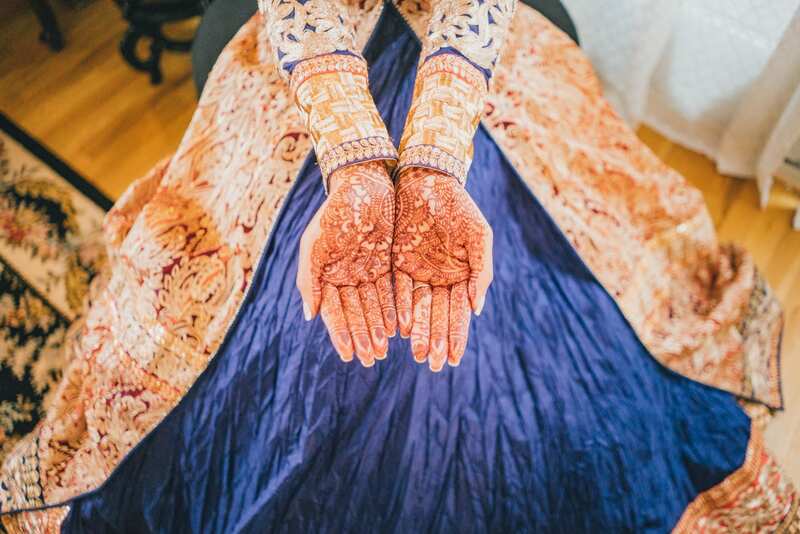 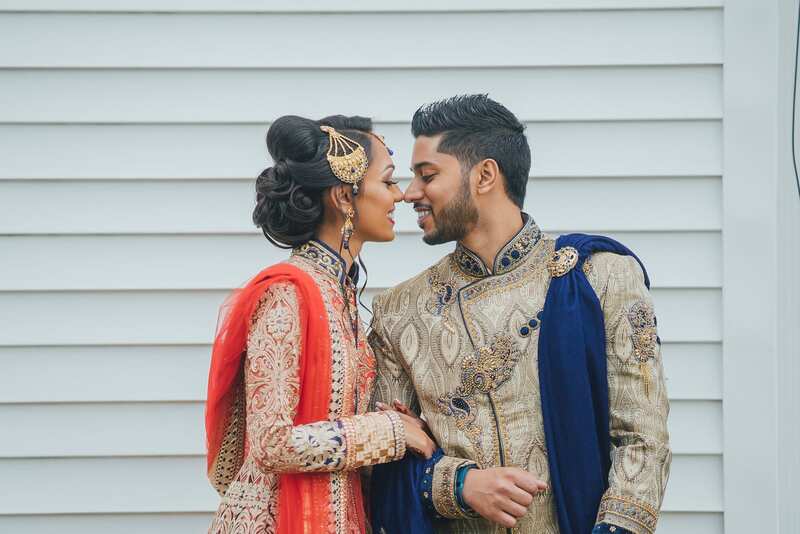 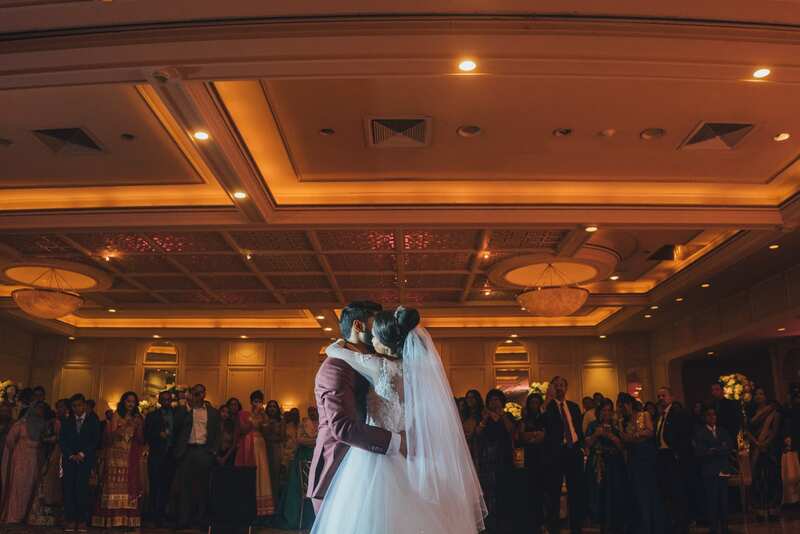 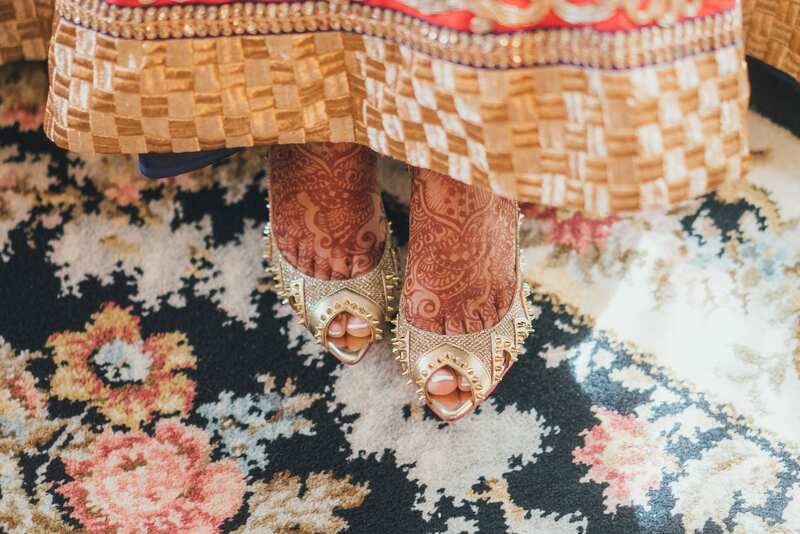 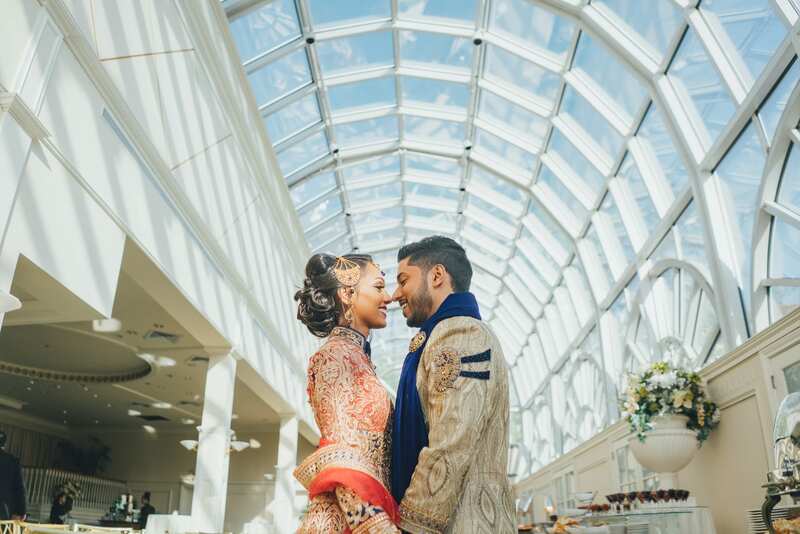 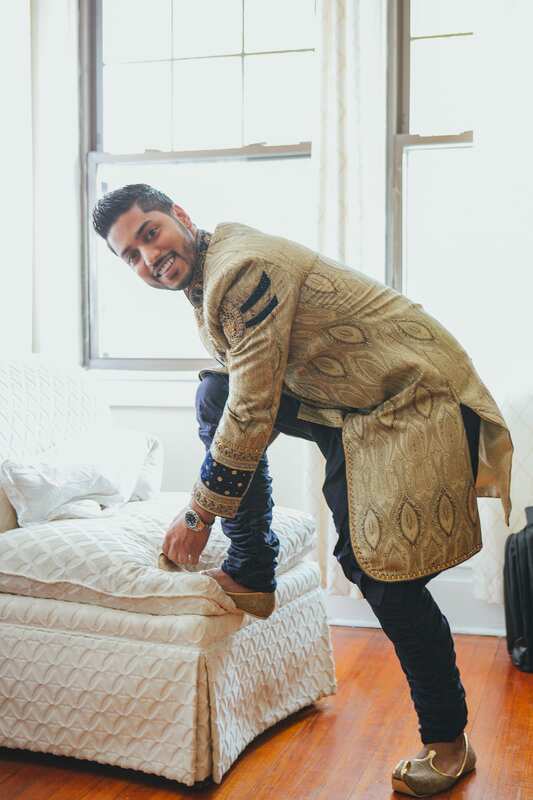 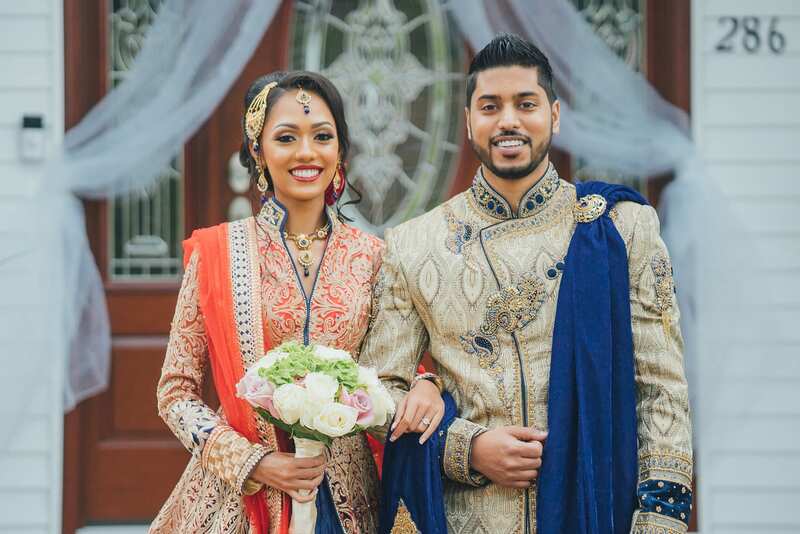 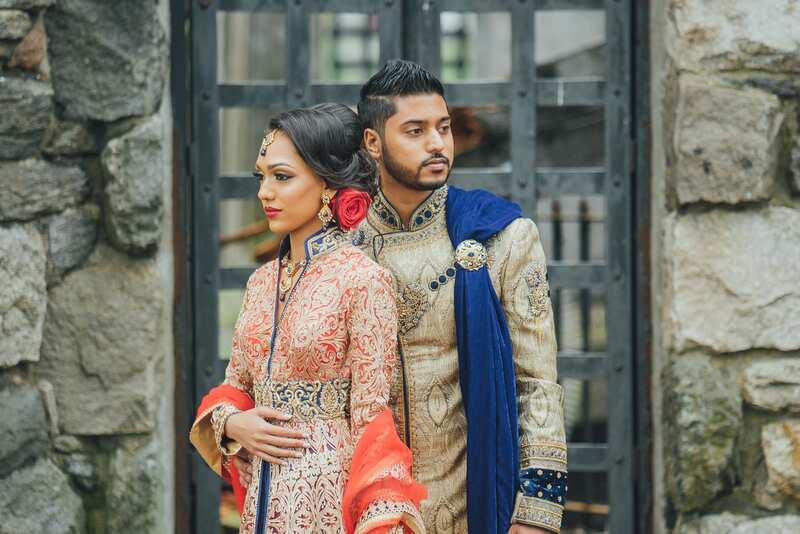 Zenaida and Hafiez didn’t just want to get married–it was important that their ceremony was full of tradition, elegance, and love for one another. 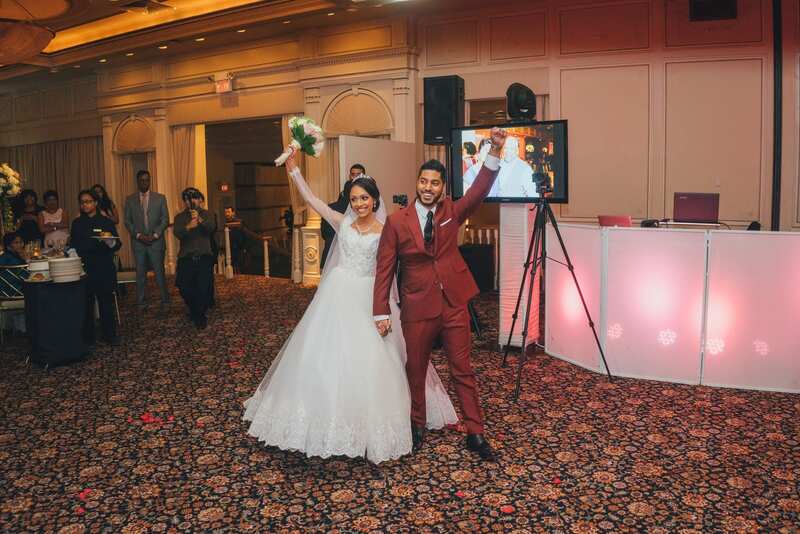 The Fountainhead in New Rochelle proved the perfect venue, with marble floors, a glass atrium, and gold leaf lobbies. 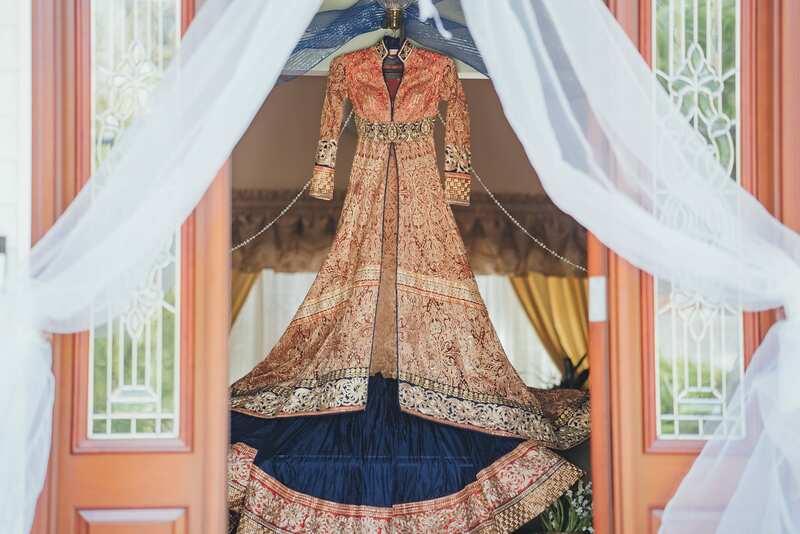 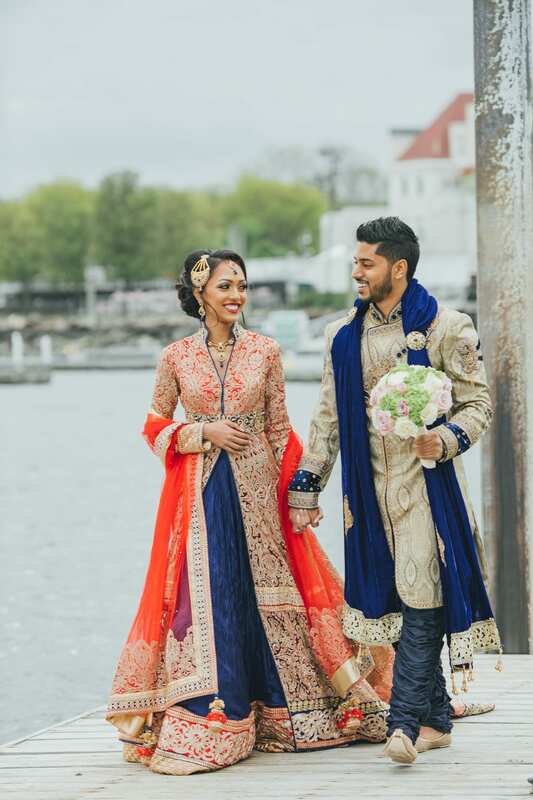 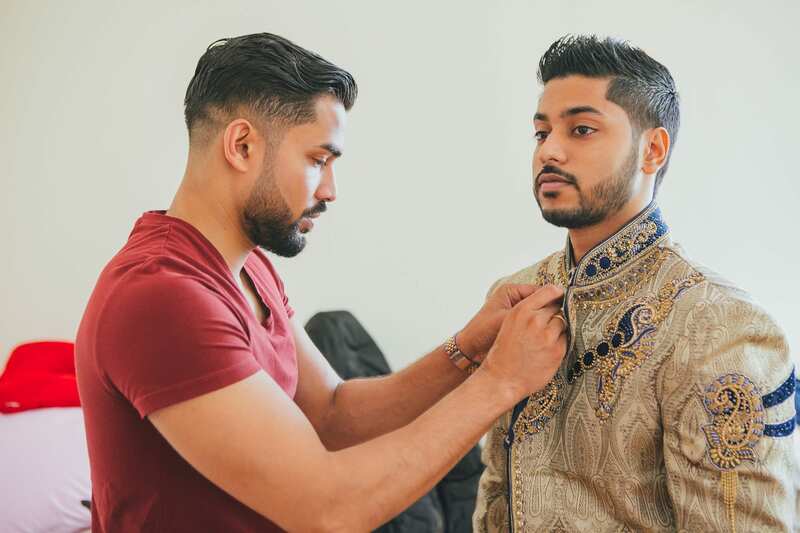 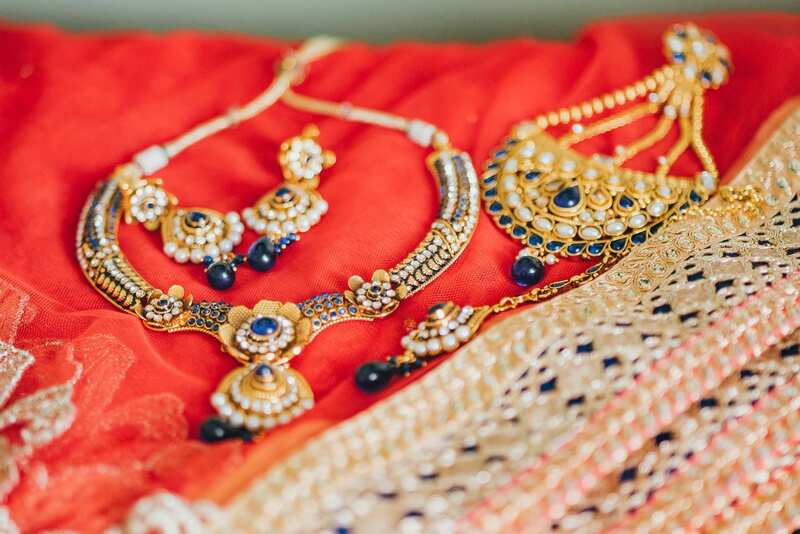 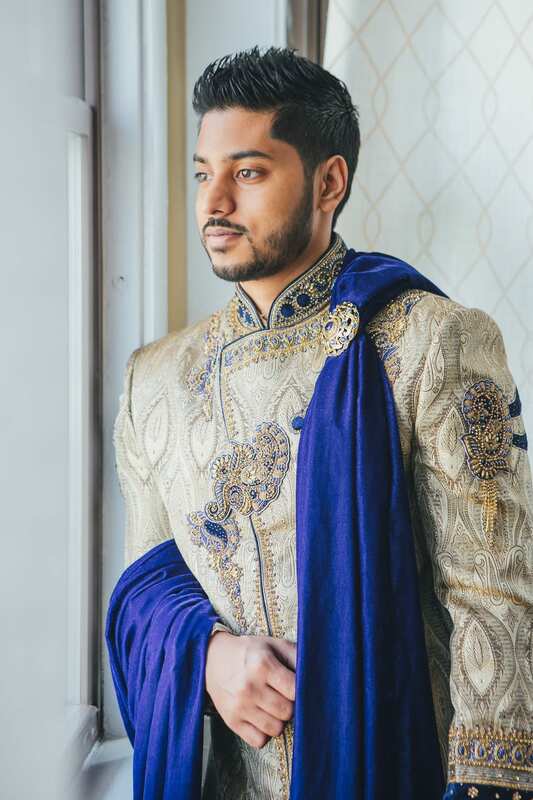 Groom Hafiez wore a Sherwangi with a deep blue and gold sash, while Bride Zenaida wore a red Lehinga with golden accents, a blue collar, and a rose in her hair. 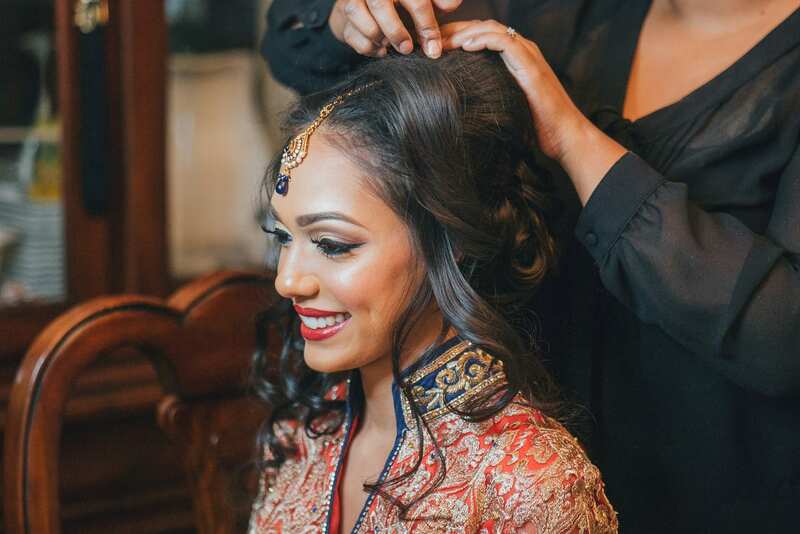 A bold red lip and eyeliner gave her a look worthy of royalty. 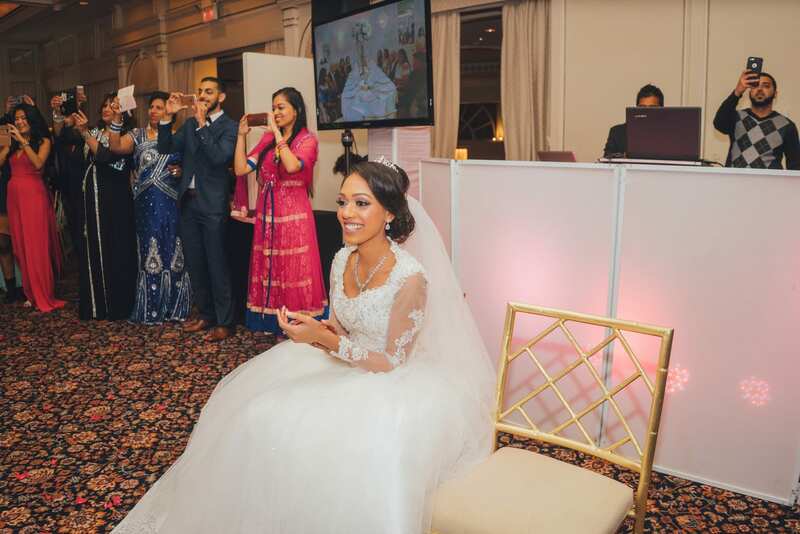 For the reception, the couple added some modernity to the mix. 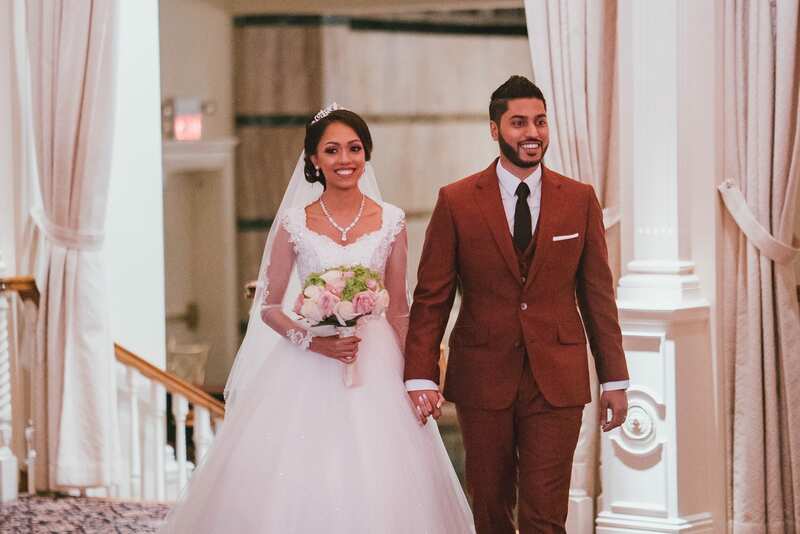 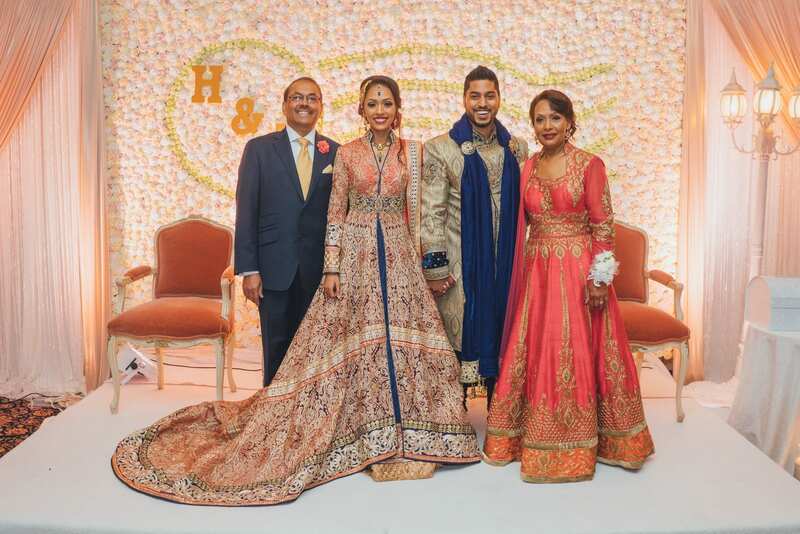 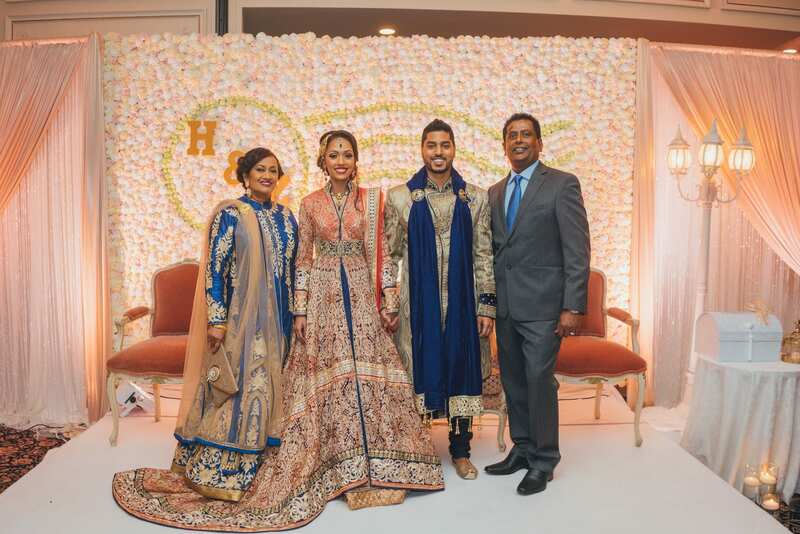 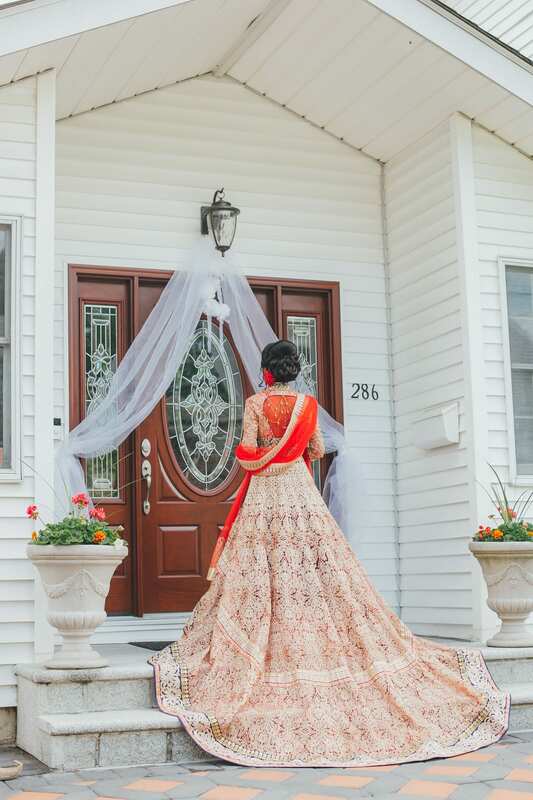 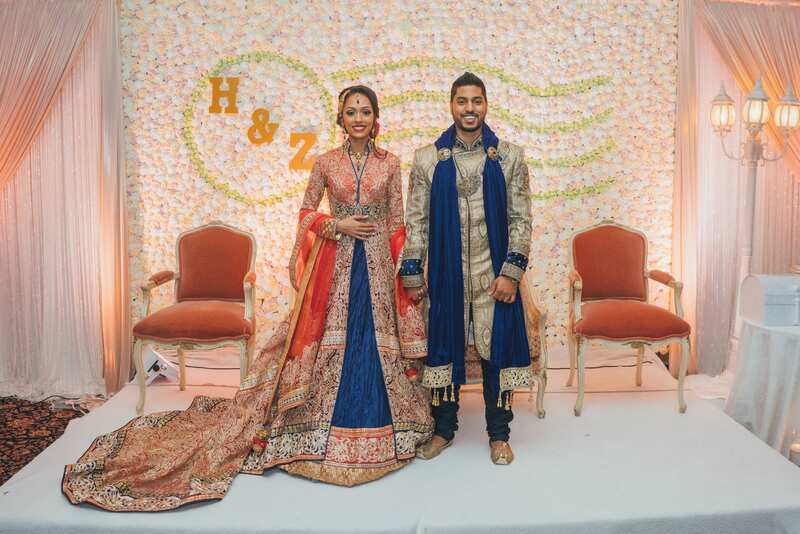 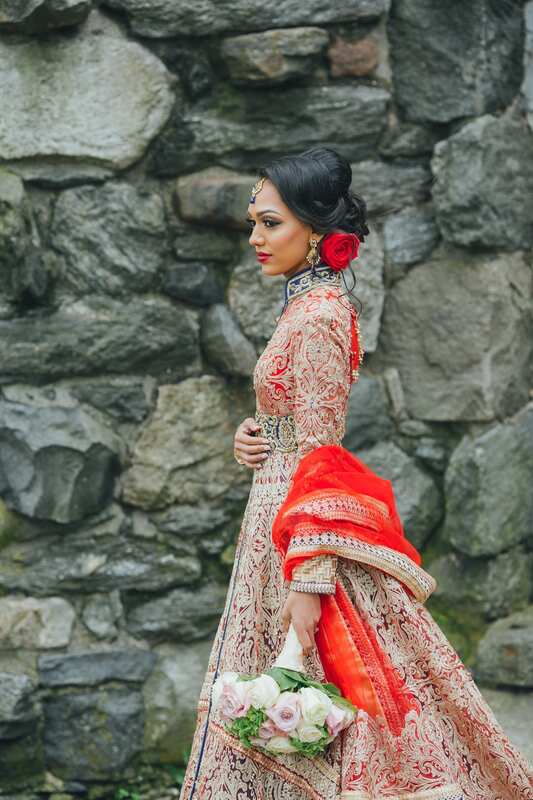 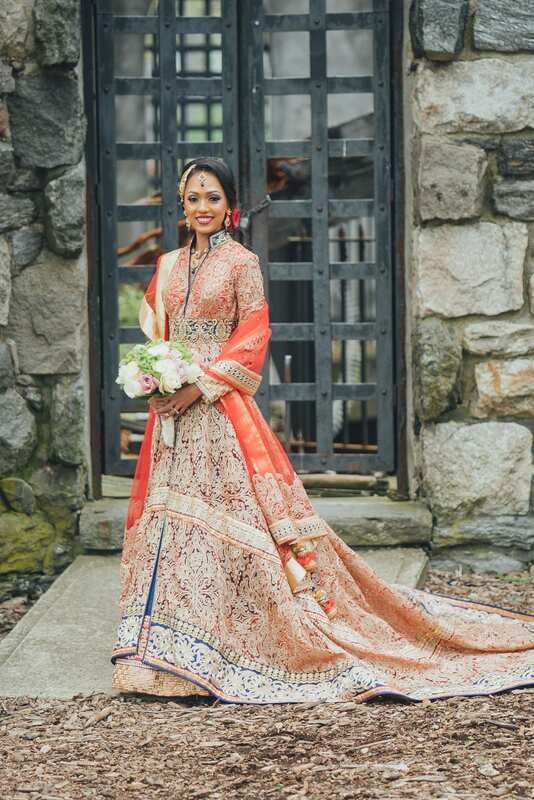 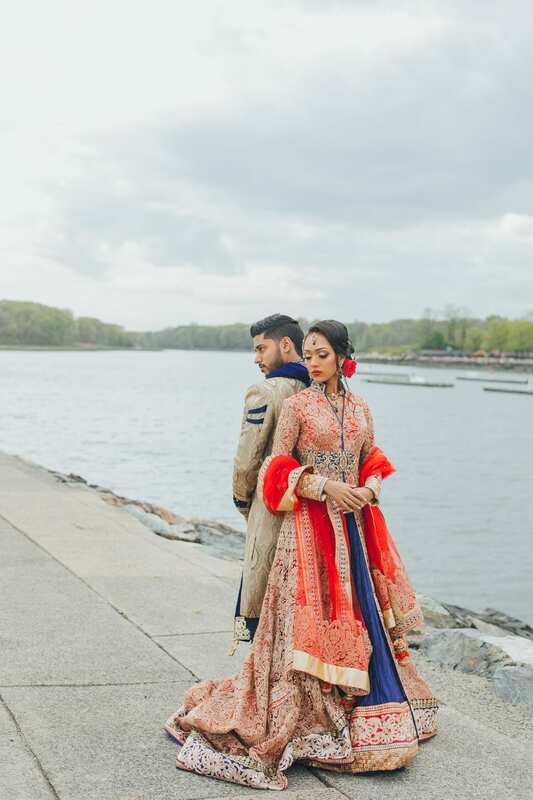 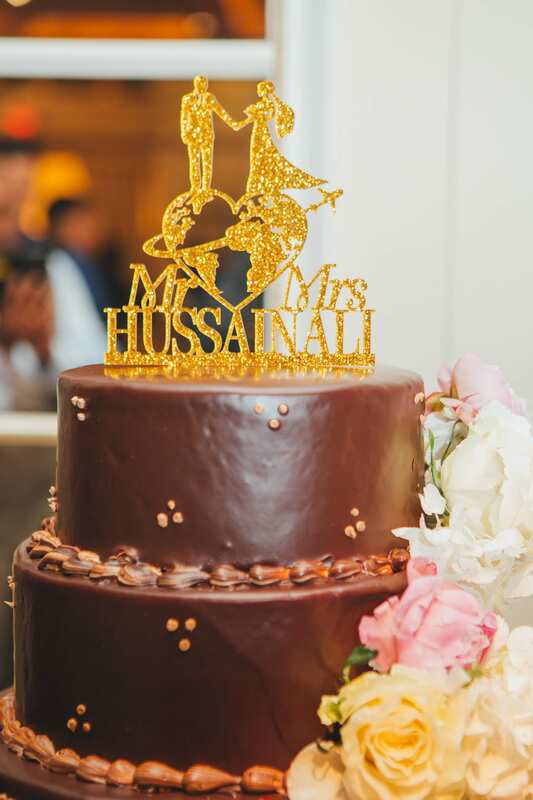 Hafiez changed into a rust -toned suit; Zenaida was a modern-day princess with a silver tiara, fingertip veil, and blush and pink rose bouquet. 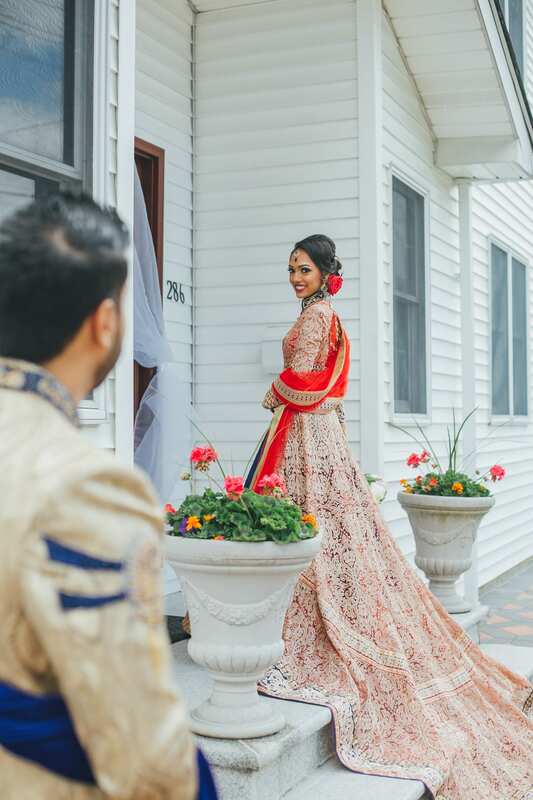 Her wedding gown featured illusion sleeves with lace cuffs, a full tulle skirt, and a lace and glitter bodice. 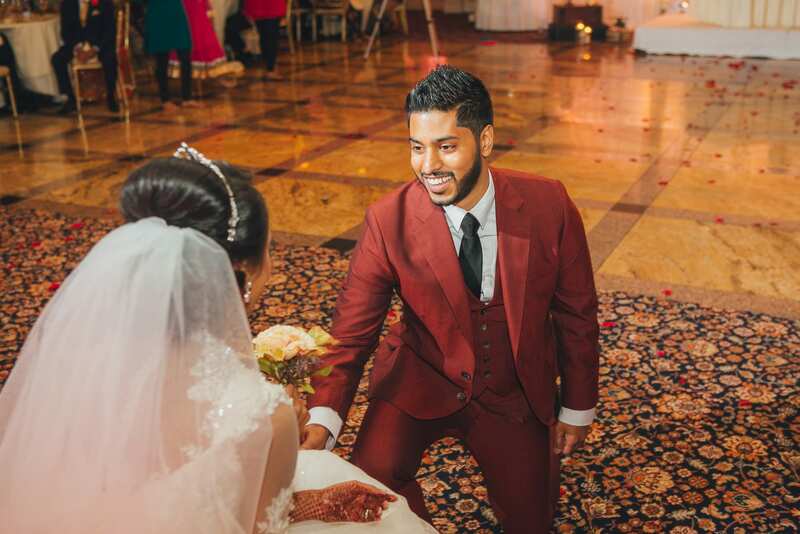 IntotheStory captured the most beautiful moments: toasts with prayers for the new couple; a dance floor adorned with rose petals, and plenty of blissful laughter. 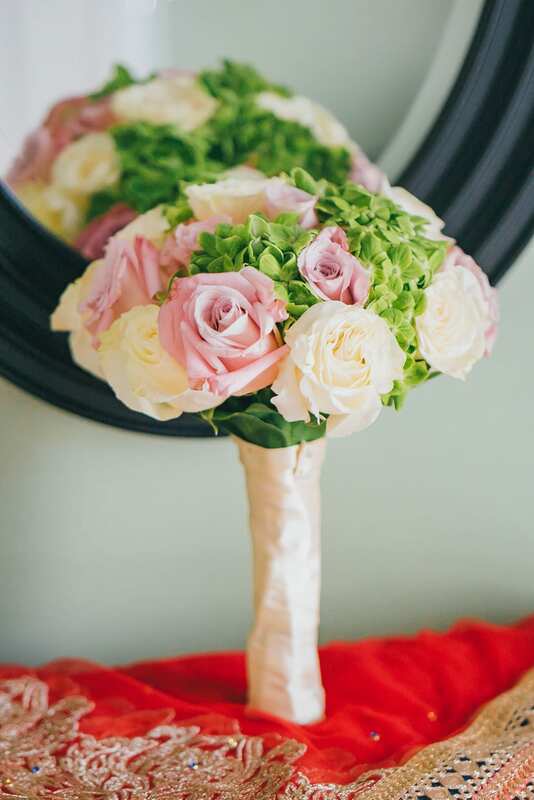 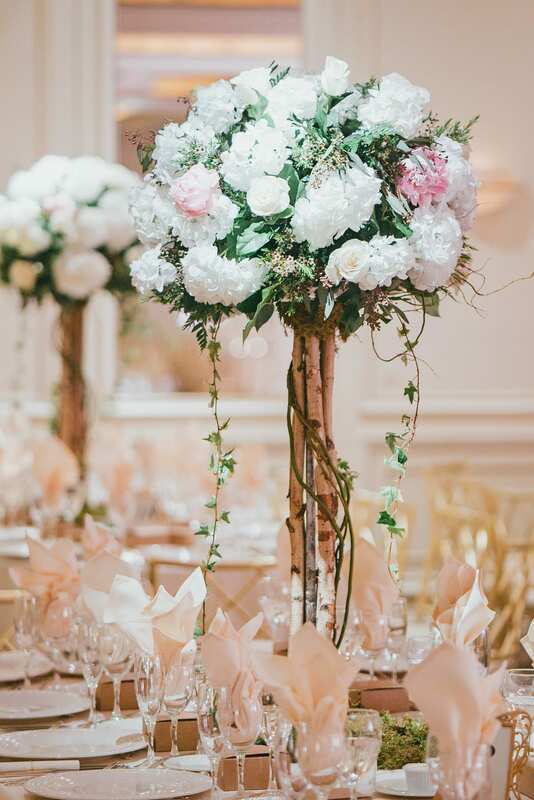 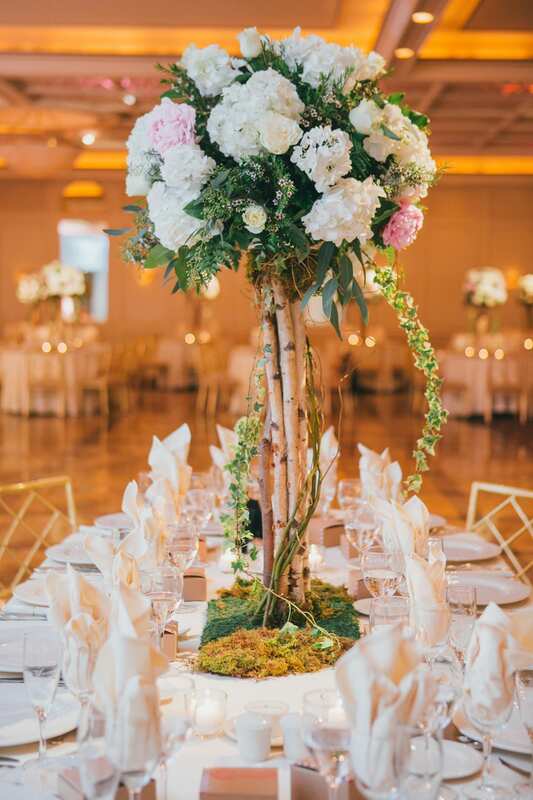 White tables were given a pop of color with bonsai trees decorated with top bouquets of ivory and pink roses and foliage.